The man responsible for bringing the original Green Lantern Hal Jordan back from the dead has been tasked with bringing the entire DC Universe to life in an all new medium. DC Comics writer Geoff Johns has been tapped to pen the story behind Sony Online Entertainment's DC Universe Online, collaborating with comic artist Jim Lee on the project. Excuse me if I gush a little bit, but the union of these two creative minds can only mean good things for the upcoming MMO. The only thing that could go wrong with a dream team like this working on the project is their work not translating well to the new medium, and that hardly ever happens. Hit the jump for some new screens from the game while I try to swallow that massive lie in the name of hope. Geoff Johns Announced As Writer For Upcoming DC Universe™ Online Video Game Acclaimed DC Comics Writer To Script DCUO Back Story AUSTIN, Texas - Sept. 15, 2008 - Geoff Johns, the renowned writer behind popular DC Comics such as Green Lantern, Action Comics and Justice Society of America, has been brought on to write the saga of the DC Universe™ Online (DCUO) massively multiplayer action game from Sony Online Entertainment LLC (SOE) in a first-ever collaboration with legendary comic artist Jim Lee, the company announced today. DCUO for the PLAYSTATION® 3 computer entertainment system and the PC is currently in development by SOE in collaboration with DC Comics and Warner Bros. Interactive Entertainment. 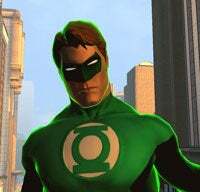 "Having a writer of Geoff's caliber brings even more authenticity to the DC Universe Online, and should provide fans with an exciting new medium for his storytelling skills," said John Blakely, SOE-Austin's VP of Development. "Together with Jim Lee, who is our executive creative director for the game, we are tapping into the very best talent from the comic book industry." Johns, 35, was born in Detroit and studied media arts, screenwriting, film production and theory at Michigan State University. After moving to Los Angeles, he worked as an intern and later an assistant for film director Richard Donner, whose credits include Superman: The Movie, Lethal Weapon 4 and Conspiracy Theory. Johns began writing comics starting with 1999's Stars and S.T.R.I.P.E., which he created for DC Comics. Comic writing eventually became his full-time career with notable works including The Flash, Teen Titans, 52, Action Comics, and Infinite Crisis. "Taking comic books into the online space presents an exciting and unique opportunity for me as a writer," said Johns. "I'm looking forward to creating a thrilling story that explains why the DC Universe has suddenly been populated with millions of new heroes and villains in a way that will engage players." "We've brainstormed about the DC Universe many times but this will be our first time working together on something of this magnitude," added Jim Lee. "This really shows the level of commitment everyone on this project has to capturing the DC Universe in an authentic, compelling way." DCUO offers a dramatic online setting where players can enter the DC Universe and battle alongside or against their favorite DC Comics heroes and villains including such icons as Batman, Superman, Wonder Woman, and The Joker, as well as many other fan favorites such as Green Lantern, The Flash, Catwoman and Martian Manhunter. The action and drama will play out in such well-known locations as Gotham City and Metropolis among others.